Through a very planned out process and structure a great experience was allowed to be brilliant. The balance between classroom and horse experience was perfectly orchestrated. The result-I found me again!! Thank you! Thank you so much for letting my power be UNLEASHED! I knew it was there all along! Are there even words? Alive…alive is the word I needed the weekend with. Is there anything better than going home from an event feeling embraced by an internal strength? I have known for a while where my heart has been pulling me, after this weekend I am ready to fill my life with passion and feel ALIVE!! An amazing, eye opening & fun experience that has helped me so much already & I haven’t even had a chance to process it yet! Thank you to JR and Brandon! Thank you to all! As someone with no experience working with horses, I was both curious and nervous to see how they could help me. I discovered that each horse has its own way of guiding you towards answers within yourself, if you are willing to pay attention. This all happens in a safe, supportive, caring, positive, and enthusiastic environment, where your thoughts and realizations about yourself and life in general are welcomed and heard. I am so glad I attended this workshop. It was not easy, but no one ever got anywhere by staying in one place. The things I learned about myself are invaluable and will stay with me forever. Thank you so much, Kari, Carolyn, Karsyn, and Bri for a fantastic weekend! A day that helped me look inward to myself and my "restrictions". It felt liberating to "let go" and share. Also inspiring to hear/see others challenges and insights. This day was way too awesome!! I started my new journey on my path to bigger and better. I am so thankful to have connected with you 4 amazing women! What an inspiring day! I know the lessons I learned today will stay with me. Congratulations and kudos to you all for the work, love, and sharing you put into this tremendous day! Thank you, thank you thank you! You have no idea how much this day means to me. 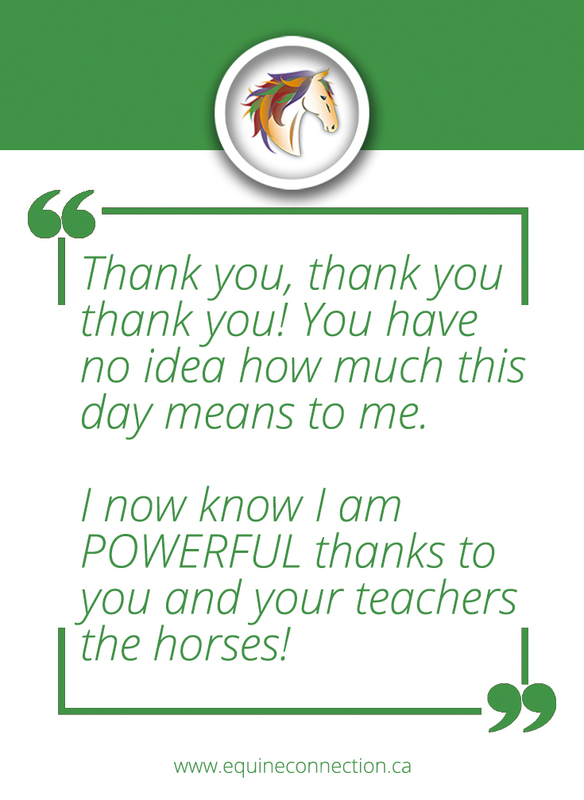 I now know I am POWERFUL thanks to you and your teachers the horses! Horses are my passion; have been this way since I was very young! Learnt that I must communicate clearly every time! Live in the here and now! These moments will never come again! Fun! Friendship! Horses! An amazing journey of listening, communication, trusting, and a lot of laughter. Loved being here and feeling the confidence to do more! Thank you for the opportunity! What a wonderful day! Learnt so much about myself. Very empowering! Love you guys! This was the best workshop I have ever been able to attend… Working/learning from/ with the horses has brought me further in my confidence than anything I have ever done. Jan, Erin, Kari, and Carolyn were awesome - thank you! !